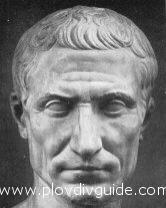 This year turns 2055 since Julius Caesar?s crossing the Rubicon River and his entering Italy (49 B.C.). He thus broke one of the Roman Laws, according to which he, being a pro-consul, has the right to lead armies only outside the territory of Italy. That is how the phrase ?crossing Rubicon? was coined - meaning ?to take irreversible decision?. His crossing the river started a civil war. Up to 42 B.C. the river was the boundary between the Roman province of Galley and Italy.